Remember the 1980s? Ah well, I am quite sure that many of the younger generation who were born in the 1990s would not have had the kind of fun that we had with ghetto blasters as well as boomboxes, basically being a terror on every side of the adults in the neighborhood. While we generally made a big nuisance of ourselves, this did not mean that we were out to do harm to anyone, unlike the seemingly more violence-inclined society of today. Well, if you are absolutely the type who needs to go one up on the rest of the “competition”, or peers, then you would surely find a way to scrounge up $4,000 lying around somewhere for the Mobile Blastmaster. 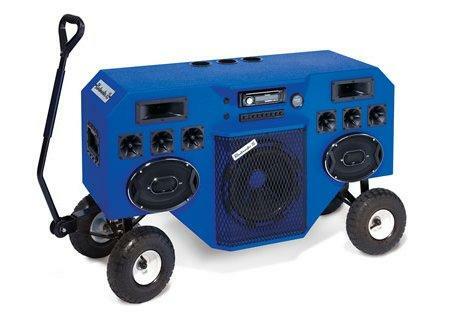 The Mobile Blastmaster has been described as a portable stereo system that will bring the ultimate optimization to the 30 year-old concept of the portable audio player, where it allows you to invite the police to come knocking on your front doorstep early in the wee hours of the morning as you blast your music at backyard or tailgate parties. Specially constructed onto a steel chassis, it will roll on a quartet of 10″-diameter pneumatic tires regardless of the terrain, sand and snow included, and is pulled along and steered with an integrated wagon handle. The eight PA-quality Piezo horn tweeters, two “6×9″ mid-range speakers, and a 12” dual-voice coil subwoofer with dedicated crossover will work together to pump out 2,000 watts of pure audio pleasure.